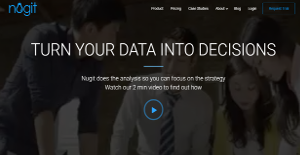 Nugit is a business intelligence platform that does all the heavy work when it comes to data analysis. It simplifies the whole process, from gathering and analyzing data to churning out high value, highly actionable insights that you can use to base your business strategy on and keep your business moving forward. By automating your data analytics, Nugit greatly boosts your efficiency. As the software handles the heavy load of collecting and analyzing data, you and your team don’t have to spend a huge amount of time trying to get the most out of your information. Once the insights are ready, all you have to do is make sense of the information you have and use it to make the smartest business decisions and take the best action for your enterprise. To succeed in this modern business environment, it is imperative that a company should look at the business and marketing data and derive insights so that they can steer their company to the right direction, make the right plays, and drive business growth. But gathering and dissecting data can take a long time and by the time insights come in, data has changed and what could have been an impactful strategy may be rendered less effective or even useless. With Nugit, you and your team don’t have to spend much of your time harvesting data from a thousand sources. You don’t have to dig through tons of information and still miss insights that lay buried beneath data. Nugit does all the hard work by automating the entire data integration, analytics, and reporting journey so you and your group can channel your time, energy, and resources on other pressing matters, like turning your business into a success. Nugit takes on data analytics with a powerful artificial intelligence and smart algorithms to deliver robust insights. It natural language generation functionality allows the software to automatically generate critical data insights in a natural language. Data ins smartly harmonized across various platforms automatically. When you need to present data in the clearest manner, Nugit provides tons of data visualizations to help you and your team show and comprehend your data right from the get go. If you are interested in Nugit it might also be beneficial to analyze other subcategories of Best Business Intelligence Software gathered in our base of SaaS software reviews. Each enterprise has different requirements and needs an application that can be customized for their size, kind of workers and customers, and the specific industry they are in. For these reasons, no software can offer perfect tools off-the-shelf. When you look for a software app, first be sure what you require it for. Read some Nugit reviews and ask yourself do you desire basic functionality or do you need sophisticated functionality? Are there any industry-specific functionalities that you are searching for? Find the answers to these questions to assist your search. There are plenty of elements that you need to consider and these include your finances, particular business needs, your company size, integration requirements etc. Take your time, try out a few free trials, and finally choose the app that provides all that you want to enhance your company competence and productivity. How Much Does Nugit Cost? We realize that when you make a decision to buy Business Intelligence Software it’s important not only to see how experts evaluate it in their reviews, but also to find out if the real people and companies that buy it are actually satisfied with the product. That’s why we’ve created our behavior-based Customer Satisfaction Algorithm™ that gathers customer reviews, comments and Nugit reviews across a wide range of social media sites. The data is then presented in an easy to digest form showing how many people had positive and negative experience with Nugit. With that information at hand you should be equipped to make an informed buying decision that you won’t regret. What are Nugit pricing details? What integrations are available for Nugit? If you need more information about Nugit or you simply have a question let us know what you need and we’ll forward your request directly to the vendor.